• wanting to expand your skills in bridging divides? • exploring effective approaches for participatory leadership? • seeking to encourage diversity and creativity, while also generating alignment and coherence? • interested in learning powerful new ways for working with groups? 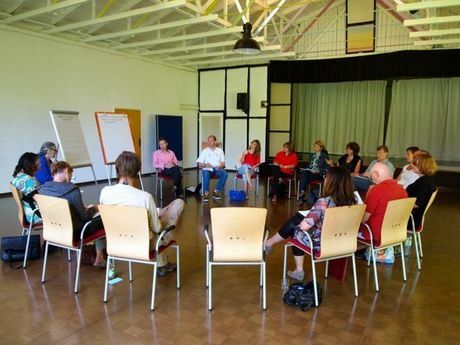 We offer experiential workshops that support effective participatory leadership. This work is for mediators, facilitators, consultants, and change agents -- anyone who facilitates complex and/or contentious issues, and wants to deepen their practice. Instead of creating unproductive friction, different points of view can lead to innovative solutions, new understandings, and more productive teamwork -- in addition to greater energy and engagement. We have led public workshops in a number of different countries. Currently, we are focused on providing customized in-house learning opportunities for mission-driven organizations. Contact us if you'd like to experience an initial taste of this work. "Rosa's workshop was transformative! I was able to apply what I learned right away, in a conflict situation with a small team within the Department of Human Services where I work as a case consultant. The interpersonal issues had confounded the staff and their managers as well as involving numerous people around the state for a long time. The conflict was resolved and the agreements kept. Everyone was amazed! I am called upon to facilitate, coach and mediate regularly. This approach provided a real shift in the work I do with groups." "I really enjoyed experiencing a decision-making/choice-making model that rests on the creative potential of conflict. As a choice/decision making process I found it more fun, flexible and energizing than the standard cooperative problem solving/consensus building that I have used. The process felt like an especially good fit for groups that have begun in dialogue to bridge deep differences, but want to move into discussing actions and making decisions. I'm definitely interested in learning more!" "I found this work breathtakingly simple to grasp conceptually, and complex to live. I was grateful that we spent the majority of time in practice. [...] From the training, I have a sense that I can apply the principles as I live, and am looking forward to more practice so I can more effectively facilitate the process as a whole. I recommend this training very highly." Learn more about this approach to working with groups on the resources page, where you can find some brief videos as well as free articles you can download. Contact us if you'd like to sponsor a workshop in your area, or to host one in-house.